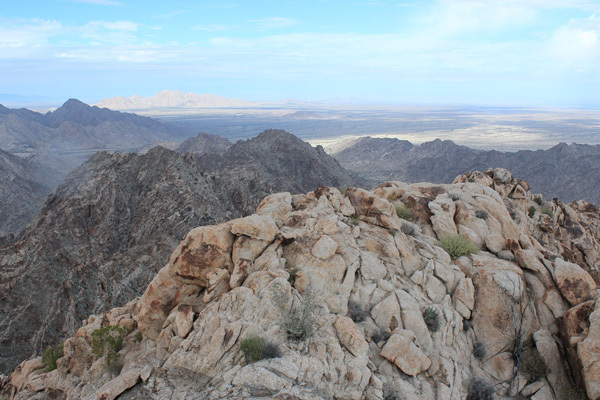 On Saturday, January 12, I joined Matthias Stender on a climb of Cabeza Benchmark, the highpoint of the Cabeza Prieta Mountains located in the Cabeza Prieta National Wildlife Refuge (CPNWR) southeast of Yuma, Arizona. 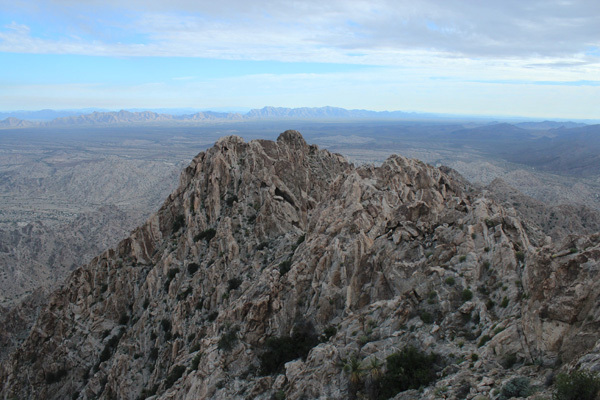 Cabeza Benchmark has only 2830 feet of elevation but has 1830 feet of topographic prominence, making it the 89th most prominent peak in Arizona. 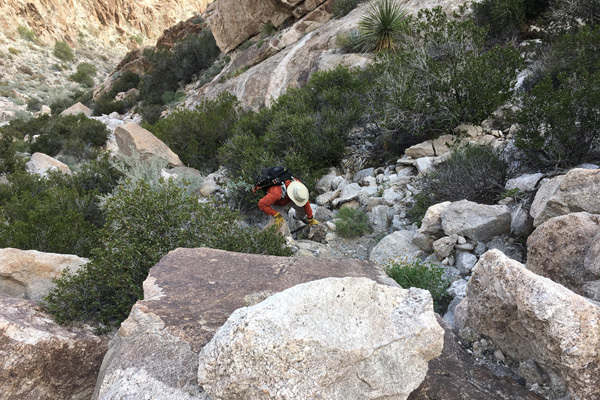 To gain access to the peak we had to travel through the Barry M. Goldwater Range (BMGR) and we obtained permits for both the range and the refuge ahead of time. I drove my Jeep 13 miles into the BMGR Friday afternoon and camped near the Copper Mountains. It was a calm and starry night. Saturday morning Matthias drove in from Phoenix and met me at my camp. From there I drove us another 13 miles to the northern boundary of the CPNWR where the road was closed to vehicles. 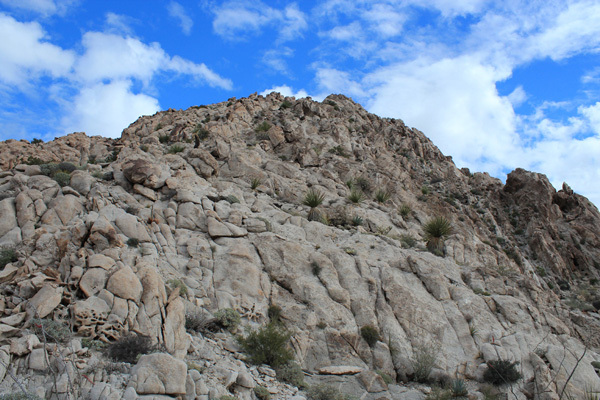 Cabeza Benchmark from the north. The NE gully opens on the left. We could see our destination in the distance from my parked Jeep. 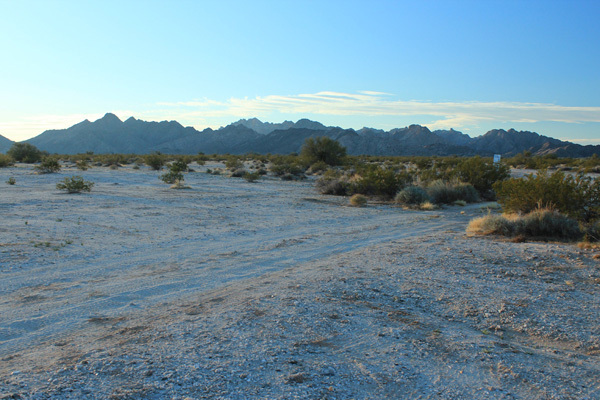 We walked the road towards the mouth of a valley, then hiked through a wash and open desert to a mile north of Cabeza Benchmark. 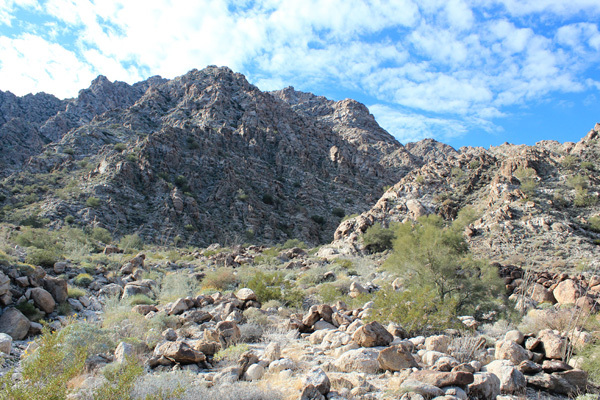 The peak looked steep and rocky with sharp ridges rising above deep canyons, typical of the mountains in the BMGR. The boulder-strewn northeast gully curved up and to the left out of view towards a high saddle from where we planned to climb a ridge to the summit. 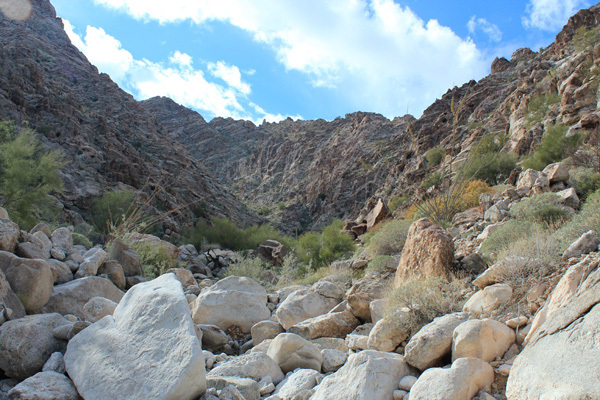 We climbed the gully over boulders and through occasional brush. The footing was good until high in the gully where it steepened and some footholds popped off when stepped on. Matthias spotted a bighorn ram traversing cliffs above us. Clouds appeared and they darkened a bit. I tried to keep up with Matthias. We reached the upper saddle at the top of the gully and took a break. It drizzled a little, then stopped. From the upper saddle the west ridge led upward to the summit. 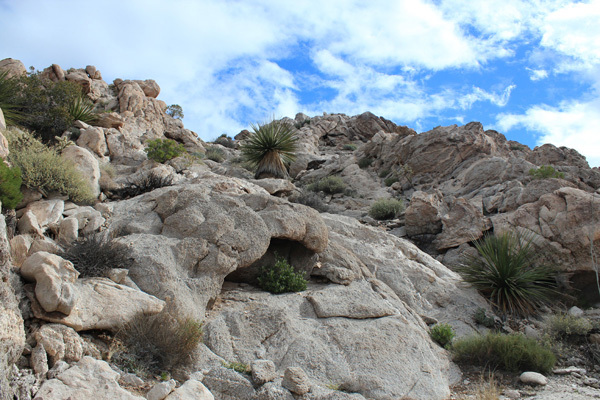 The ridge was open with firm rounded slabs and a few yucca plants. I enjoyed the open ridge as I scrambled to the summit, grateful that the weather was holding. We enjoyed the views in all directions from the summit. 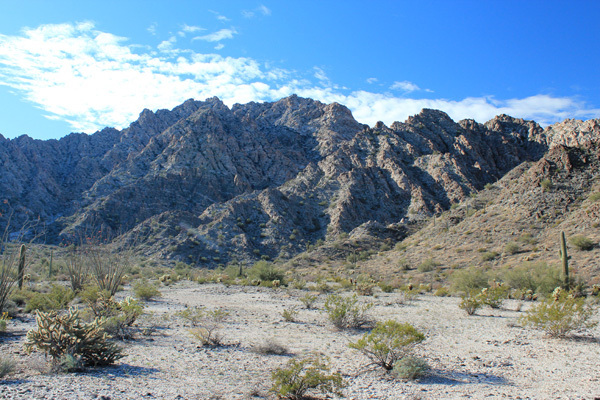 I noted the Gila Mountains, the Sierra Pinta, and the Mohawk Mountains I had visited last winter and the Copper Mountains to the north I planned to visit Sunday. Matthias pointed out the Tinajas Atlas Mountains he had visited last November. Cerro del Pinacate, a large Mexican volcano, rose beyond the Tule Mountains to the south. Matthias found the summit registry, placed in 1965. We recognized most of the names placed there in recent years. 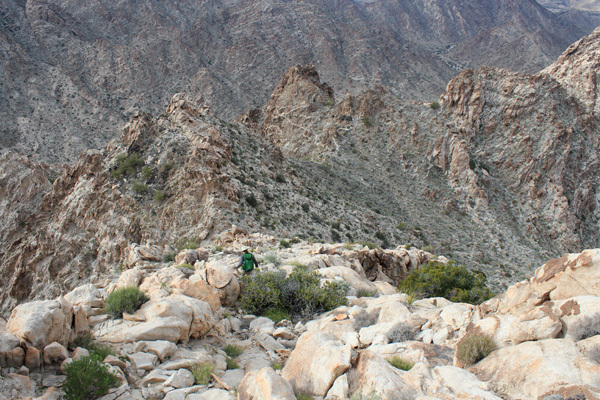 I could have lingered much longer, but we had a long route out and it was soon time to descend. We followed our ascent route down the ridge and gully. From the mouth of the gully we tried to take advantage of firmer footing on the open desert but eventually had to return to the sometimes sandy wash. I pushed to try to keep up with Matthias. I was glad I had been hiking regularly this winter. Eventually we returned to the closed road and reached my Jeep. I drove us back to my campsite near the Copper Mountains and said goodbye to Matthias. 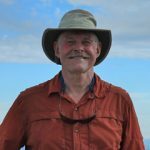 He was returning home to join Scott Peavy on two peaks the next day. I rested in camp under occasional drizzle and had dinner. I celebrated the day’s victory and hoped I could move my sore muscles and feet the next day. 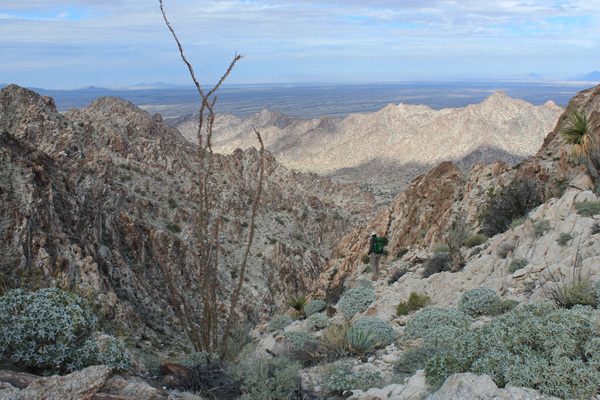 This entry was posted in Climbing, Hiking, Uncategorized and tagged Arizona, Cabeza Benchmark, Cabeza Prieta Mountains, Cabeza Prieta National Wildlife Refuge. Bookmark the permalink.